LepideAuditor Freeware is free offering from Lepide Software to the IT industry. Take a more advanced step than to just depend upon Native auditing with this tool. It audits Active Directory, Group Policy Objects, and Exchange Server. The raw logs are processed intelligently to show you the exact event for every change without any noise. Its installation and implementation are quite easy, and you do not need any license to audit your environment. After adding the domain, it automatically enables the auditing of Active Directory, Group Policy, and Exchange Server. Within minutes your IT auditing starts up. 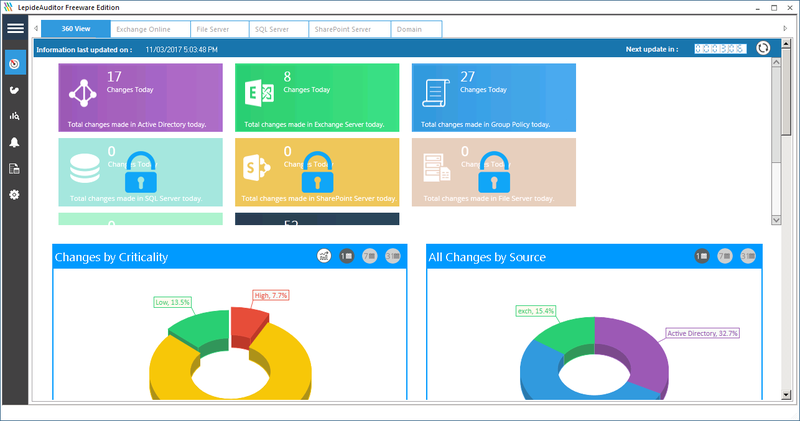 Every change made in the configuration of Active Directory, Group Policy, and Exchange Server are monitored and collected. After parsing the logs, the readable events are displayed in the audit report that can be customized with advanced filtration, sorting, searching, and other auditing functions. You can filter this report or search in it to pinpoint a critical change. Multiple instances of the solution can be run simultaneously from the same or different user accounts. EMCO Remote Shutdown (Popularity: ) : EMCO Remote Shutdown is a Freeware utility to Shutdown/Reboot one or many machines.